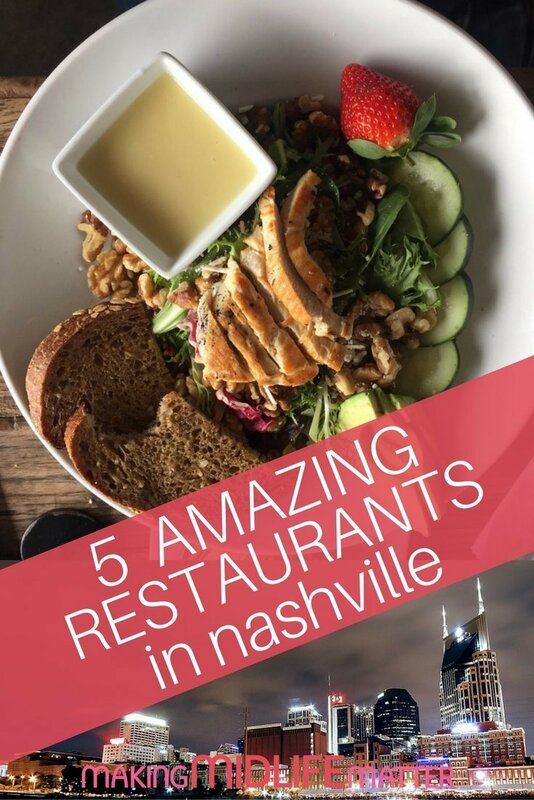 If you like to eat, Nashville is the place for you. The variety of places to eat, types food and price range are astounding! Here are the ones I enjoyed most on my recent trip to Nashville. Pub5 is a small restaurant near the Country Music Hall of Fame. We stumbled upon it by accident and were sure glad we did! Each of us had one of their delicious and filling salads that were made with the freshest of ingredients. The lunch menu included small plates, salads, sandwiches, wraps and burgers. Pub5 has a full bar featuring craft beers and is open for lunch, dinner and late night noshing. I thought the rustic/warehouse looking décor was really cool and it certainly added to the ambience! Merchant’s is on Broadway, right in the middle of the action! It is housed in the old Merchant’s Hotel, built in 1892. The dinner menu features appetizers, sandwiches, salads, burgers and Southern favorites such as Southern Fried Chicken and Brisket. 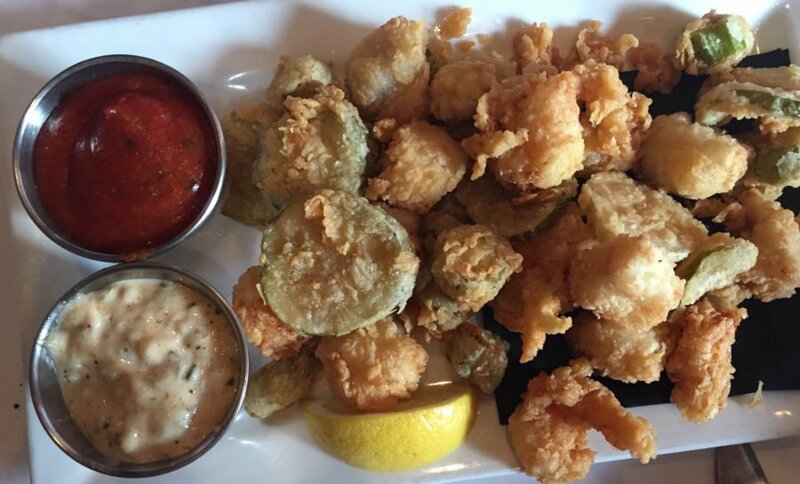 I opted for a dinner of appetizers – Duck Fat Tater Tots and the Southern Fry – a plate of fried pickles, okra, shrimp and catfish. Can you say cholesterol? Others in our party enjoyed Mac & Cheese and Sweet Tea Tenderloin. The Gulch is a cool area of Nashville with many good restaurants to choose from. We opted for Sunday brunch at The Pub, which was recommended by our Uber driver! 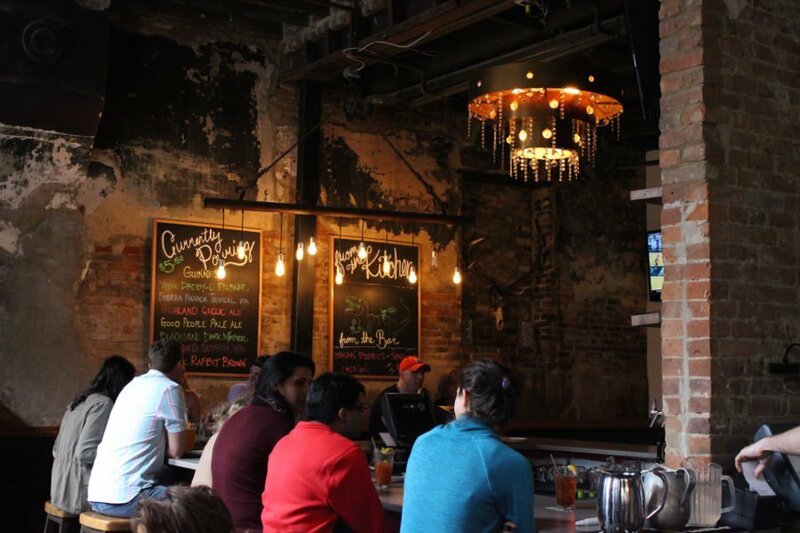 Brunch began with a trip to their delicious Bloody Mary Bar! The Pub also has a bottomless Mimosa option if that is more your style. For brunch I had “The Cure” – a sandwich with 2 fried eggs, Belhaven Beer Cheese, Tabasco, onions straws, choice of bacon or ham, all on a pretzel bun. I don’t think I have ever eaten a tastier sandwich! Other favorites of our group were the grilled salmon salad that had perfectly cooked salmon and the chicken fried chicken. 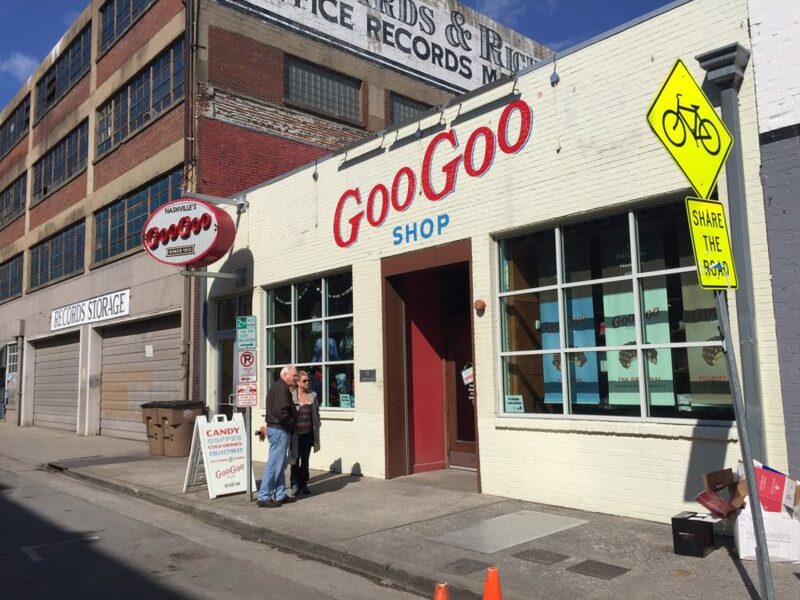 The GooGoo Shop, which is right off Broadway, is a great place to stop for a mid-afternoon snack. All kinds of sweet treats, ice cream, coffee and the infamous GooGooCluster are available. The GooGoo Cluster was created by the Standard Candy Co. in 1912 and is still made fresh from the original recipe of peanuts, marshmallow nougat, caramel covered in milk chocolate. TO DIE FOR. The Frothy Monkey reminded me of a coffee house/restaurant combo. 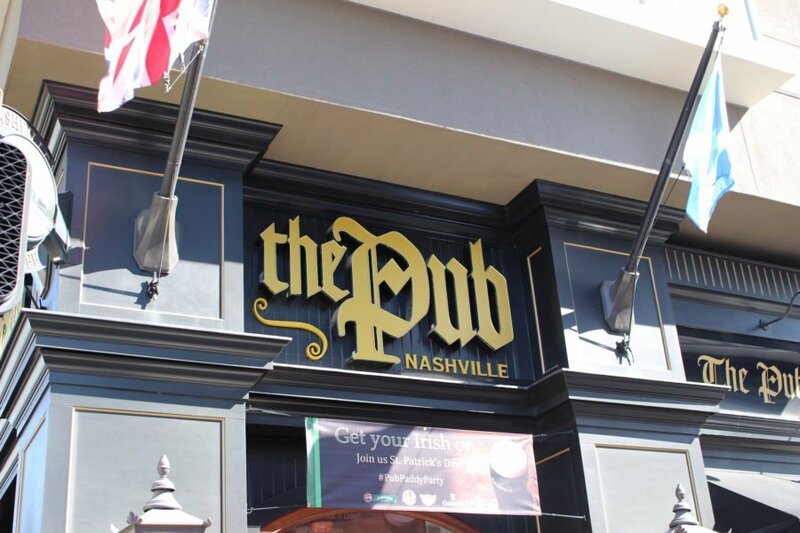 There are several locations around Nashville. They serve breakfast through dinner every day, wine, beer and fresh, locally roasted coffee. We had one of their great lunch salads after a morning of shopping in Franklin, followed by one of their delicious coffee drinks. They also have their own bakery featuring fresh breads and pastries. 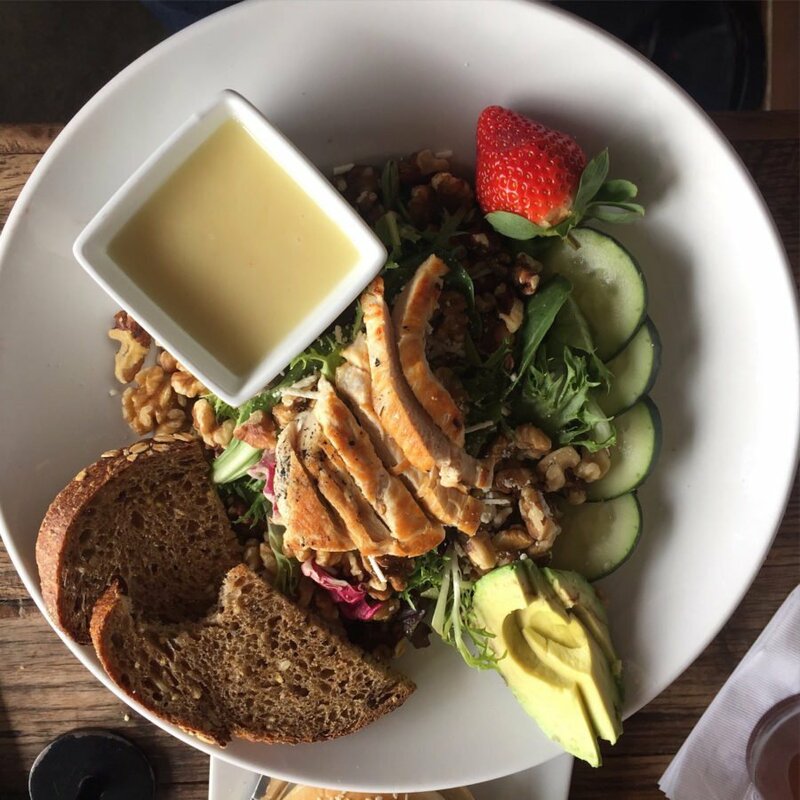 The Gail has mixed greens, grilled chicken breast, feta, cucumbers & walnuts topped with lemon garlic vinaigrette and a strawberry. Before going on this trip, I put a call out on my Facebook page for restaurants in Nashville. I received LOTS of suggestions. There are so many wonderful places! Reservations are recommended for the more popular restaurants during the evening and at Sunday Brunch time, so do your homework and plan ahead! I’m hoping to wear something besides yoga pants soon….